The bottom of each feeder is constructed from perforated glavanized sheet metal to allow for strength and drainage. All hanging feeders come with an attractive copper hook and are ready to hang. Glass patterns and colors are variable, although color schemes can be requested. The feeders have been designed to be left outside all year round. The copper accents will develop a brownish patina with age. Care in handling feeders must be taken. They will break if dropped or crushed. 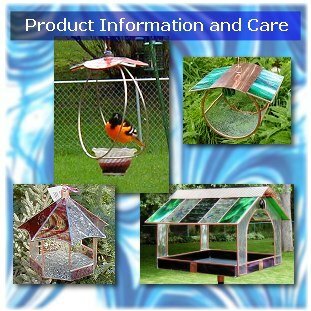 WithanE Designs birdfeeders are designed to be enjoyed by the birds outdoors. Even in the winter. My feeders stay outside all year round, and continue to look like new with a minimum of care. No feeders are squirrel-proof. If placed in a location where squirrels can get into the feeder, they will. They cannot chew the glass or copper, but may chew on the solder. It is best to hang your feeder where the squirrels dont have access to it. I also recommend safflower seed; squirrels seem not to prefer this seed as much as others, although most feeder birds eat it. These feeders are made of glass. They will break if dropped or crushed. There is really nothing I can do once the feeder is broken, except attempt to glue the glass pieces back together. If a piece of glass cracks, seal over the crack with a clear super glue. The bottom of all WithanE Designs feeders are made from perforated sheet metal and are designed to prevent birdseed from getting moldy. Air should circulate from the bottom, and if the seed has gotten wet from rain or snow, it should dry out fairly quickly. Clean feeders with mild dish soap once or twice a year. You can use a sponge or scrub brush. Do not put stained glass birdfeeders in the dishwasher  it may break down the solder. If you wish to restore the shine to the copper, you can polish it with brass or copper polish. After polishing it, to keep the shine a little longer give it a coat of any type of car wax, then buff it out. Enjoy your feeder. With a minimum of care it should stay beautiful for many years.